Bogart, Ernest Ludlow (1919). David Kinley, ed. Direct and Indirect Costs of the Great World War (2nd ed.). Vancouver: Oxford University Press. ISBN 0-7748-0923-X. May, George Ernest (1922). "Dollar Securities Mobilization" . In Chisholm, Hugh. Encyclopædia Britannica (12th ed.). London & New York. Vogel, Martin (1922). "Liberty Loan Publicity Campaigns" . In Chisholm, Hugh. Encyclopædia Britannica (12th ed.). London & New York. Chambers, Theodore Gervase; Lewis, William Mather (1922). "Savings Movement" . In Chisholm, Hugh. Encyclopædia Britannica (12th ed.). London & New York. Sutton, George Augustus (1922). 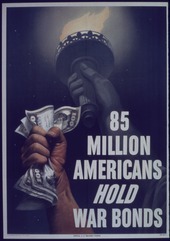 "War Loan Publicity Campaigns" . In Chisholm, Hugh. Encyclopædia Britannica (12th ed.). London & New York.